Speerhas Business Machines prides itself on its prompt, quality service on many different makes and models of office equipment, thus our motto "Your Total Customer Care Specialists." Brian Speerhas has over 25 years of experience working on copiers and fax machines, bringing you the technical expertise to get the job done right. Mr. Speerhas has been a service manager for two different companies and has spent many hours in the field troubleshooting all sorts of machine malfunctions. He is factory trained on many Toshiba, Mita and Minolta copiers and has factory certification on many faxes. Brian and his staff now bring this wealth of experience to you through Speerhas Business Machines. 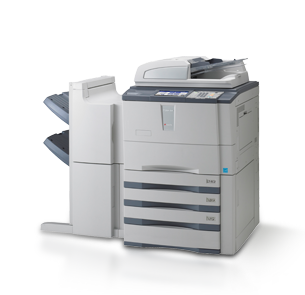 Speerhas Business Machines has service contracts available for copiers and faxes which cover everything except paper! Now that is service and dependability that is hard to beat! Speerhas Business Machines primarily specializes in office copiers and fax machines, but we also service printers, shredders and many other types of office equipment. We stock a wide variety of parts for copiers and faxes and bring these right to your location. Speerhas Business Machines has an average emergency response time of less than four hours to keep your office running smoothly. We will even supply you with a loaner machine if we can't fix yours in a timely manner. For your next copier or fax machine, or for quality service on your current equipment, call Speerhas Business Machines and let "Your Total Customer Care Specialists." take care of your problems and concerns. We will do our best to make you happy. "Your Total Customer Care Specialists"